Interest in the ICAC’s executive short course has never been greater. In October 2015, 35 participants secured a spot in “Strategic responses to corruption”, a four-day course run jointly by the ICAC and the Australia and New Zealand School of Government. Due to the strong response, the course will run twice in the next financial year and there are three times as many scholarships on offer! 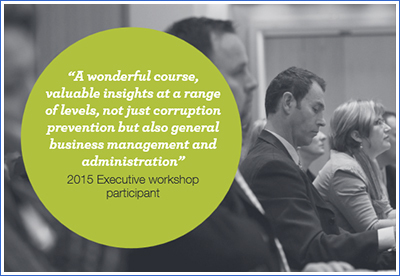 This year, “Strategic responses to corruption” will run in Sydney from 13 to 16 September. It will be followed by a second course from 7 to 10 March next year. Below, Adam Shapiro, Senior Project Officer Training and Development at the ICAC, explains what attendees should expect to get out of it. Why is the course aimed at executives and senior managers? This course focuses on the corruption control inherent in well designed and managed operational arrangements. Many of the changes needed to make an organisation truly resistant to corruption require senior executives to take action. It is often only senior people who can advance changes in how an organisation is structured, how it manages information, where it locates decisions, how decisions are made and who is accountable. Senior executives are also usually involved in deciding where an organisation draws its boundaries, what it chooses to outsource and how it manages outsourced functions. Senior personnel need to understand the motivations associated with the designed and emergent incentive structures that exist as a result of all of these decisions. They also need to understand and manage what equity and entitlement issues may arise and the group norms at play. Corruption prevention and risk management strategies are essential in any place of business, and particularly so in public sector organisations. What makes for a successful strategy? Government organisations are there to provide a service to the people. Corruption gets in the way of the organisation delivering those services and conducting its business efficiently and effectively. The best corruption prevention strategies minimise opportunities for corruption by leveraging off the control inherent in well designed and managed systems. Such systems incorporate clear objectives, well designed and managed processes, backed up by reliable sources of information and appropriate accountabilities. Well designed systems factor in what motivates people and include incentives that steer people in the right direction. They also ensure that staff have the capabilities required to do a competent job. While we can never design out all risks, the tighter the system is, the fewer risks there are and the less reliance we need to place on costly and often cumbersome risk treatments. So, we design an efficient and effective system and then apply traditional risk management strategies to the risks that we cannot design out. The number of applications to the course was unprecedented last year. What do you put that down to? Corruption prevention is often seen as putting a hand-break on government activity. In recent years, the ICAC’s focus on preventing corruption through well designed and managed operational arrangements has become better known. People can see the double benefit of being able to deliver on operational goals more efficiently and effectively while simultaneously preventing corruption. It is a compelling approach that is very attractive to senior executives who want to prevent corruption without preventing work. This course is about how – when done properly – corruption prevention can be used as a tool to improve overall performance. The ICAC offers scholarships in addition to fee-paying applicants. There were always 10 scholarships on offer, but this has jumped to 30 for this financial year. Who is eligible and how can they apply? Scholarships are limited to NSW public officials in senior roles in state agencies and local government where the officer has significant power or influence over the design of operational arrangements in their organisation. A number of selection criteria apply and each must be addressed on the application form. The application must also be endorsed by the principal officer of the applicant’s organisation. More information on the scholarships and how to apply is available from the ICAC website. Applications close 29 July 2016. How do people find out more about the course and how to enroll? Information about the course content, presenters and scholarships for NSW public officials is available on the ICAC website. Fee-paying applicants can enquire about the course or enroll online via the ANZSOG website . Does the ICAC offer other training to NSW public officials? Yes, we do. The ICAC has a suite of free half- and full-day workshops that are available to individual public officials via our open workshops program. The ICAC will also visit NSW public sector organisations free-of-charge to deliver workshops to staff in-house. For more information, visit the ICAC website or send an email to workshops@icac.nsw.gov.au. In addition to the executive short course, the ICAC offers free workshops across NSW throughout the year to help public authorities and public officials understand how and why corruption occurs, where the opportunities for corruption may be and how it can be prevented, detected, investigated and addressed. Three new workshops were introduced last year to the existing workshop series. For detailed information on all training opportunities, visit the ICAC’s website. To request an in-house workshop, send an email to workshops@icac.nsw.gov.au or telephone the ICAC’s training and development team on 02 8281 5729.